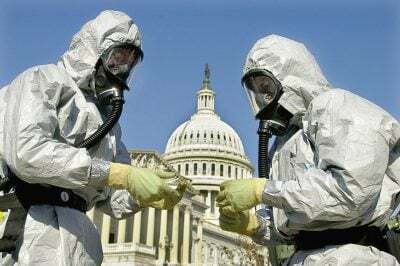 It was reported this morning (October 2) the Pentagon mail facility has received at least two packages containing the deadly poison ricin. Immediately after the anthrax attacks in 2001, Bush neocons put pressure on FBI Director Robert Mueller to prove the mysterious attack was the work of al-Qaeda, a fantasy on par with Saddam’s WMDs. This story—the essence of fake news—left out something important: it takes complex equipment to prepare anthrax spores for weaponization and it was highly unlikely if not impossible for Osama bin Laden and al-Qaeda to produce the substance in a remote Afghan cave. Both Bush and Cheney made the claim and the Wall Street Journal published an article linking the attack to Osama bin Laden and Iraq. Reports by ABC News followed after the late John McCain insisted the anthrax attack was the work of Iraq. McCain, celebrated as a true American hero after his death, was in cahoots with the Bush neocons to get a war going in Iraq. As #Ricin found at #Pentagon, a reminder of when investigators were under intense pressure from GOP to blame Islamic terror for Anthrax, & instead they followed facts until the likely culprit turned out to be an American scientist. The anthrax attack dovetailed with other absurdist fake propaganda and helped promote the plan to invade Iraq. It was also instrumental in the passage of the Patriot Act, thanks to then Attorney General John Ashcroft haranguing the House Judiciary Committee. The anthrax attack was exploited in standard problem-reaction-solution fashion. After the attack and media hyperactivity, the US once again began throwing money into biological warfare research. The government gave the National Institute of Allergy and Infectious Diseases $1.5 billion in 2003 and Congress passed Project Bioshield Act, which provided $5.6 billion over ten years for the purchase of new vaccines and drugs, thus providing transnational pharmaceutical corporations a welcome influx of taxpayer money. How long before a revitalized cadre of neocons folded within the Trump administration blame this attack on Iran or Russia? The UK set the example when it blamed Russia for the Skripal “Novichok” poisonings, a transparent and completely baseless accusation that was embraced by the US and its parroting corporate media.